Muslim Prayer Service at the Democratic National Convention? Really? The Democratic National Convention is set to begin next week in Charlotte, North Carolina. The convention will present current President Barack Obama with the nomination, so there will be no surprises. However, there is a lot of hoopla surrounding a rumor that has been viciously circulating on the Internet regarding the possibility of the DNC sponsoring a Muslim prayer vigil for a couple of hours before the start of the convention. This story is being spread in the usual ways, through social media, chain emails, and good old word of mouth. We’ve had some people contact us wanting us to give it a more thorough investigation. A common Jumah congregation. This is simply a Muslim tradition where they get together and pray on the final Friday of the month. Like most things like this, there are several different variations of the message. All of them revolve around the DNC “choosing” to have Islamic Jumah prayers for two hours on the Friday before its convention. That would be earlier today. The messages also go on to say that the DNC turned down a Catholic cardinal’s request to lead a prayer at the convention earlier in the year. 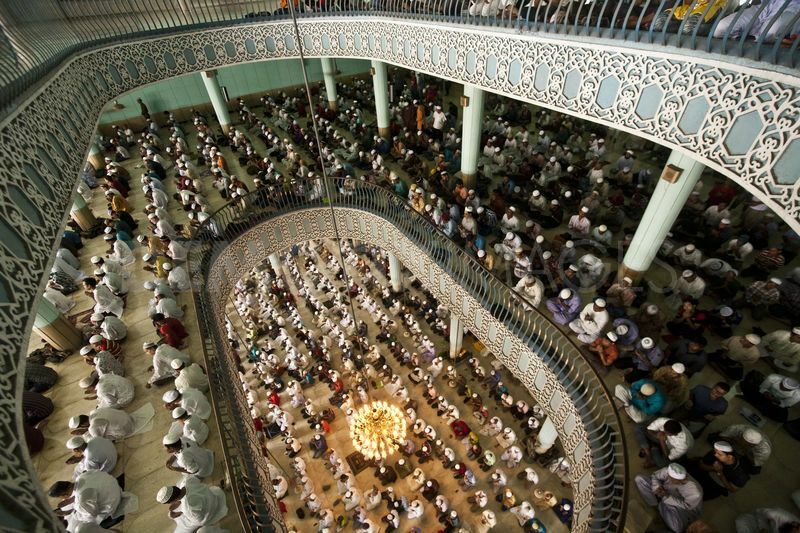 Jumah is a Muslim tradition in which a prayer is held as a congregation on the last Friday of each month. To try to add authenticity to the story, many of the messages link to an article from Glenn Beck’s website. Some go on to add other details, like that the DNC is paying to bus in 20,000 Muslims, for example. Well, let’s start pulling this one apart, shall we? For the record, we are writing this after it has already happened. No fortune-telling here. There was a case of Jumah today in anticipation of the Democratic National Convention. However, the messages circulating on the net are trying to make people believe that the Democratic Party sponsored this and requested that it be done. The reality is nothing like that at all. An independent Muslim organization in Charlotte, North Carolina called the Bureau of Indigenous Muslim Affairs is where this prayer service originated. They publicized the event as “Jumah at the 2012 DNC.” But the prayer service was held in a city park and not in any official part of the convention. They did this on their own business website. At no point did any official logo or DNC endorsement appear on the website. This Muslim organization simply decided to hold a public Jumah prayer service on its own, and the only connection to the DNC is simply that they called it “Jumah at the 2012 DNC.” Moreover, the DNC official website makes no mention whatsoever of any Muslim prayer service. It does, however, show that the cardinal that was supposedly turned away from the DNC will be overseeing the closing of the convention with a benediction. So, that would be another falsehood. Strike two. So, the final verdict: yes, there was a Muslim prayer service held in the vicinity of the DNC. No, the DNC didn’t have anything to do with it. And no, the DNC did not ban prayers or Catholic cardinals from their proceedings. It’s probably not hard to figure out who is probably behind this campaign. The concept that President Obama is a closet Muslim has been going on since before he won the first election in 2008, and we have addressed that issue in previous articles. This spreading of misinformation is probably trying to play on that misconception. Common Sense Conspiracy does not endorse either candidate in the upcoming election. We have made it pretty clear how we feel about America’s two-party system and the “illusion of choice.” However, we do feel that if people out there want to attack the President’s policies in his first term, they should do so with real facts and not by spreading…well, you know our slogan. Previous PostMichelle Obama Gets It Right — Why Watch the Conventions Anyway?Next PostPoor People Should Work Harder Claims World’s Richest Woman Gina Rinehart — You Really Didn’t Build That!